Etheal is now listed on ico-check.com! Etheal ICO Pre-Sale is LIVE NOW! Stay tuned for more! Etheal Presale starts on November 29th! Etheal has been added to the Cheddur app! We are currently focused on migrating our working healthcare service comparison portal to the blockchain. 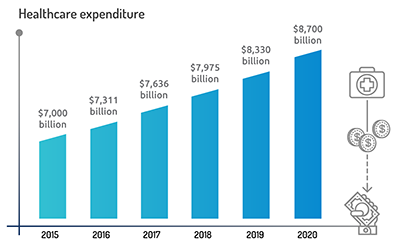 Healthcare expenditure grows by $300B every year. Priceline Group (Booking.com) made $10.64 billion last year in revenue, by selling accommodations online. Their current share price is above $1,800. According to Oxford Economics and Visa, medical tourism is predicted to become a $540 billion industry by 2025 with 25% CAGR. ”I had my right hip replaced in 2008 at a clinic in Utah, and the total fees to the insurance company were $28,000. I had my second hip resurfaced in Colorado in 2010, and the total fees to the insurance company were close to $78,000. I have had several friends do the Belgium clinic for hip replacements, and they have had good results. Increased participation in colon cancer screenings alone could lead to 21,000 saved lives every year in the US alone. We intensely focus on UX and hiding the complexity of crypto world, creating a gateway for a vast amount of users and money to join the biggest revolution since widespread internet adoption. We have already tested our strategy, 2,500,000 people use our site yearly (Doklist.com), and we currently potentially reach 230M people on 2 opposing sides of the world (Brazil and Hungary). Our goal is to build a 2.0 decentralized version of our current successful solution, which is based on 141 858 lines of code and serves 2.5M visits a year. We have planned every step of our roadmap to maximize the value increase of the Etheal ecosystem in the shortest amount of time possible. First, we are focused on creating a decentralized incentivization and unified settlement layer in Ethereum. This will help us rapidly expand to 30 countries and increase the quality of our local doctor databases with automated smart contract driven incentives. Taking advantage of the blockchain-based incentive system and the resulting high-quality global database, we aim to quickly become a dominant player in rapidly growing markets (medical tourism and pharmaceutical communication research and advertisement), currently worth more than $117 billion globally. Opening up our platform to let anyone write an Etheal Application is the logical next step to grow the Etheal Ecosystem further. Finally, we will focus on the maintenance, development, and marketing of the Etheal platform for it to become the “Booking.com, Steemit and Salesforce of Healthcare”, with a model capable of generating $100B+ of potential revenue. Selling the proper utility HEAL token is the next step on our roadmap. You can now join our community and help us build a better healthcare system together. 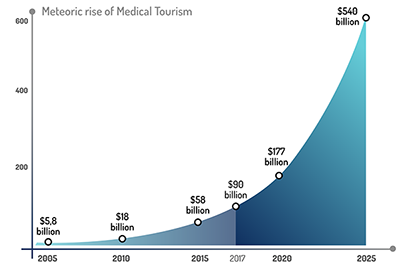 The strongest short-term growth driver will be Medical Tourism lead generation, where the market is predicted to grow to $540 billion by 2025 according to Oxford Economics and Visa. The second biggest growth driver will be pharmaceutical communication research and advertisement, which is a $27 billion market in the USA alone. Physicians will also be able to bid to be included in the top 3 featured spots on search results, where in contrast to Google Adwords, their quality score is not dependent on how good of a website they have, but instead on the quality of service they provide. A doctor who provides excellent service, will have to pay less for the same featured spot. 5% of all revenue generated through the Etheal Ecosystem will go to the Etheal Operation Fund to cover operating expenses, 15% will go to the Weekly Contribution Endowment Fund rewarding patients and care providers. Most of the applications developed by us will be free, however, paid applications will use different models. For instance, pharmaceutical advertising is planned to be a revenue share model of 70%-30%, where users earn 70% and 30% goes to the Etheal Operation Fund. Decentralization Layer: used to store permanent information in the blockchain and to transparently automate incentivization and the payment layer of the ecosystem while storing larger quantities of data on the InterPlanetary File System (IPFS). Backend Off-chain Layer: used to cache and hold data and changes which are not needed to be stored in the blockchain and to provide an API endpoint to easily access and embed data from the ecosystem in any website or application. Etheal Platform Layer: consists of a sandbox and a simplified UX and mobile-friendly front-end where stakeholders can interact with the Etheal Ecosystem. 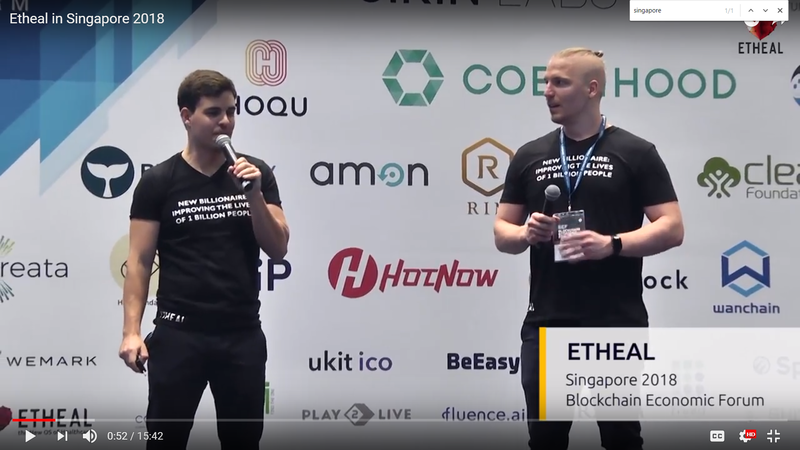 With the blockchain, we can instantly resolve our most difficult scaling and automation challenges. Charlie Munger says that getting incentives right is the most fundamental thing to build a sustainable business. Why do we need a dedicated token? An internal token which can be used as a dedicated method to get discounted services, and transfer value. 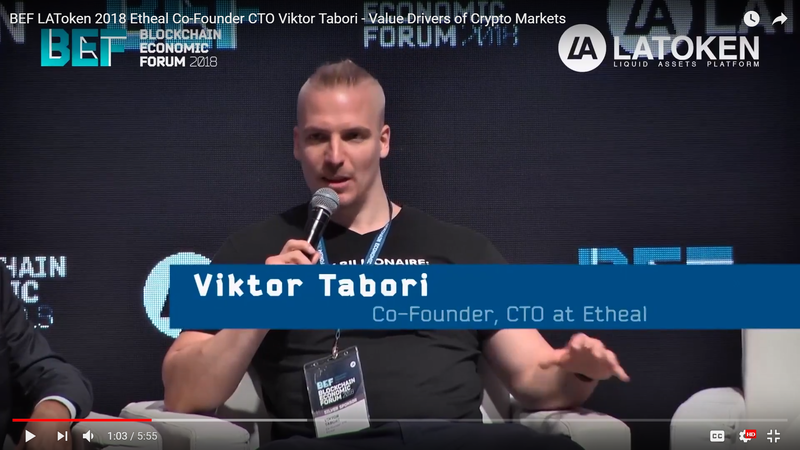 Fair initial distribution, and balanced long-term incentives to reward those, who use and contribute to the ecosystem. To build a community, which believes in a future of better healthcare. What is the use of HEAL tokens? 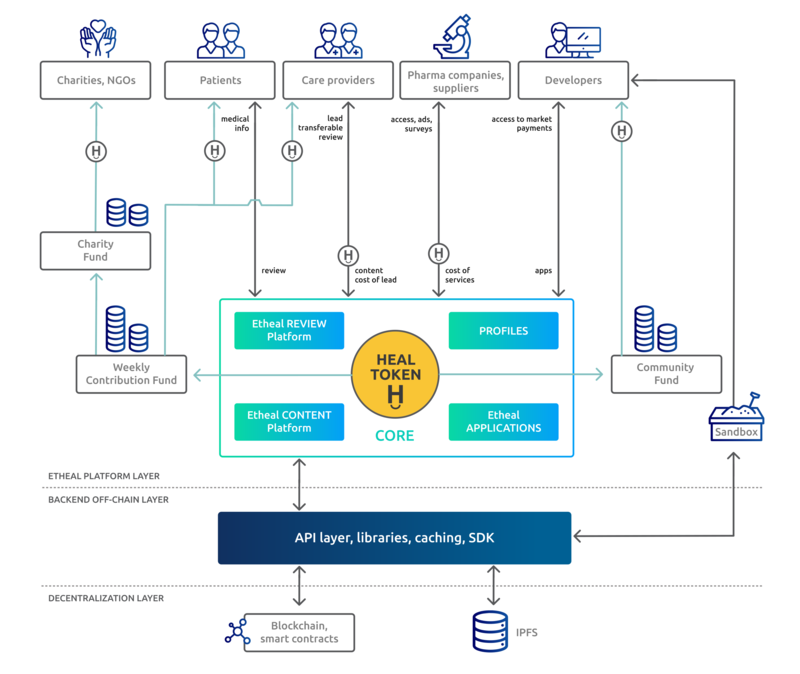 What does Etheal plan to do to grow demand for HEAL token? The more people use ETHEAL, the higher the demand is projected to grow. The more countries we expand to, the higher the demand is projected to grow. The more applications are built on top of the ecosystem, the higher the demand is projected to grow. Incentivize developers in 10 strategic areas according to the usage of their applications in the ecosystem. We optimize to create a review system which is useful across borders (geography aware). In the last decade, we have worked in the cut-throat competitive e-commerce field, where we gained invaluable experience. Intended to use for paying development bills, data processing, legal counselings, customer service, sales, marketing and in general to grow the ecosystem. We calculate your stake by summarizing all of your transfers increased by a bonus at the time of receiving the fund. At the end of the sale you will receive HEAL tokens, the amount of which is based on the ratio of your stake to the total stakes. We have set aside 2M HEAL tokens to award those, who help to build the Etheal community in its early days. Every whitelist applicant will get a personalized referral link, and they will get 5% bonus after every contribution using that link, plus each contributor will also get an additional 1% bonus for using a referral link. Example: One of your friends signs up for whitelist using your referral link, and buys 10,000 HEAL tokens during sale. You will get an additional 7% * 10,000 = 700 HEAL tokens. Your friend will get 3% * 10,000 = 300 bonus HEAL tokens. Remaining referral reward HEAL tokens will go to the HODLER reward fund (50% to lot 6 months and 50% to lot 9 months). To keep prices stable in the early months we use extensive vesting for founders, team and advisors, and we reward those who HODL. Keep tokens intact (can’t move any portion of it) on your wallet for 3/6/9 months after the normal sale has ended, and a 10M HEAL token HODLER reward will be distributed in total among token sale HODLERs in the ratio of their intact stakes to the total amount. Join us on discord or telegram. Please note, that we are not looking for greedy whales and speculators seeking a quick P-n-D. We are obsessed to create value for the community of dedicated true believers in a new standard of healthcare (see the token vesting section). Disclaimer: This ANN is not for US residents, US residents will not be able to participate in HEAL token sale. Disclaimer: I'm not a project team member or anyhow related with this project. All responsibility belongs to the project’s team members. Prior to acquiring the HEAL tokens, a prospective purchaser should consult with his/her own legal, investment, tax, accounting, and other advisors to determine the potential benefits, burdens, and other consequences of such transaction. Nothing in this White Paper shall be deemed to constitute a prospectus of any sort or a solicitation for investment, nor does it in any way pertain to an offering or a solicitation of an offer to buy any securities in any jurisdiction. This document is not composed in accordance with, and is not subject to, laws or regulations of any jurisdiction which prohibits or in any manner restricts transactions in respect of, or with use of, digital tokens. The HEAL token is not a digital currency, security, commodity, or any other kind of financial instrument and has not been registered under the Securities Act of 1933, the securities laws of any state of the United States of America or the securities laws of any other country, including the securities laws of any jurisdiction in which a potential token holder is a resident. The HEAL tokens are not being offered or distributed to, as well as can not be resold or otherwise alienated by their holders to, citizens of, natural and legal persons, having their habitual residence, location or their seat of incorporation in the country or territory where transactions with digital tokens are prohibited or in any manner restricted by applicable laws or regulations. If such restricted person purchases the HEAL tokens, such restricted person has done so on an unlawful, unauthorized and fraudulent basis and in this regard shall bear negative consequences. 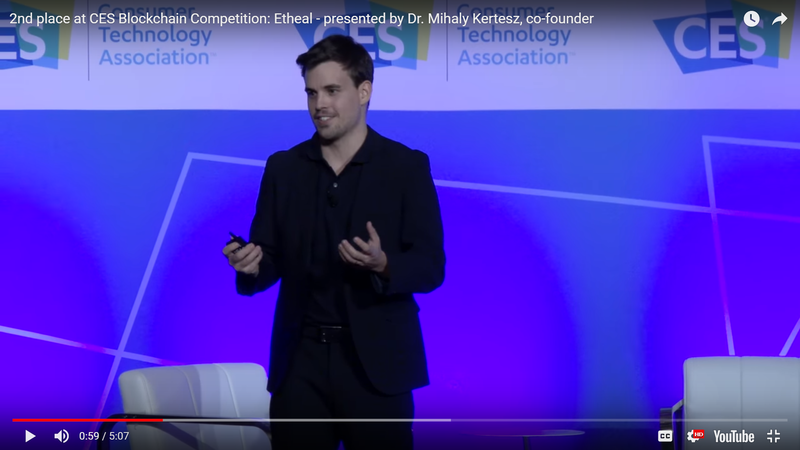 Etheal neither offers or distributes the HEAL tokens nor carries on a business (activity) in any regulated activity in countries and territories where transactions in respect of, or with use of, digital tokens fall under the restrictive regulations or require from Etheal to be registered or licensed with any applicable governmental authorities.